11.5" x 3.5" x 12.5"h.
A space-efficient gear hauler intended to transport a single day's worth of supplies. Slim design won't get in the way on overgrown trails or in close quarters. Not just for the wilderness, but also an excellent Pack for urban exploration, not to mention your daily commute. Dimensions: 11.5" x 3.5" x 12.5"h.
French Military Surplus F1 Day Pack, Like New is rated 4.7 out of 5 by 7. Rated 4 out of 5 by RICHARD from The pack was well made but wasn't going to work for me so I have sent it back for exchange . This would be good for someone not wanting to carry bulky items like vacuum [Thermos] bottles in the main bag . The large top flap would be useful for carrying clothing removed as the person warmed up while hiking . Rated 4 out of 5 by LINDA from Looks to be just what I want-water repellent,size. Strong storage smell-will have to air awhile. Rated 5 out of 5 by ERIC L from Great day or light overnight pack - light, compact, waterproof exterior and well designed for carrying weight close to the body, like an alpine pack. The main pack capacity can be expanded upward with the waterproof side extensions, and there are lots of tie-down straps for adding a light sleeping bag and pad. I liked it so much I bought a second one for my wife. Rated 5 out of 5 by JOHN A from Nice pack, as advertised. It appears to be water resistant. Too bad the French used canvas straps and a canvas back on it. 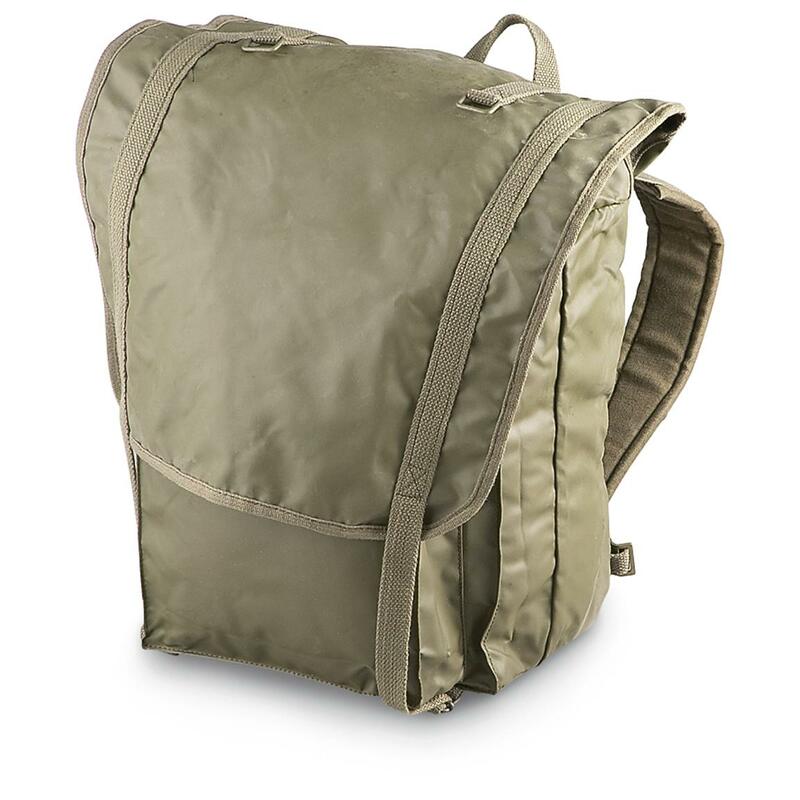 Rated 5 out of 5 by CHRISTOPHER from High quality backpack. Nice size for a day trip. Good deal. Rated 5 out of 5 by JOHN from Great for the trip to dear blind. Rated 5 out of 5 by OMID from Chinese made cheap stuff are more expensive than this. this is a steal.